Author: Arnold Kiel. Series edited by: Bernd Heine, Wilhelm J.G. Möhlig. Although the compiler of this Maa bibliography is not an expert in the study of African languages, the editors of the series East African Languages and Dialects find the result of his long-lasting collection worth to be presented to wider academic public. Since the early 1970s, Rev. em. 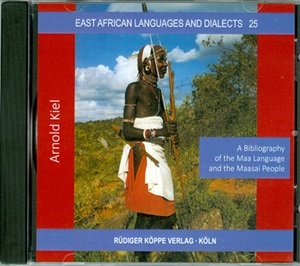 Arnold Kiel spent almost thirty years of his active life either among or in close neighbourhood to the Maasai people. The result is a bibliography that is a collection of over 3,750 published and unpublished works on Maa and the Maasai people. Maa is a Nilotic language from Kenya and Tanzania, spoken by approx. 1 Million people. The bibliography is covering archaeology and history (incl. early travel and discovery reports) of Kenya and Tanzania; Palaeontology, Archaeology, History and information concerning the whole area once inhabited by Maasai (incl. National Parks, Geology, Botany, Zoology, Ecology etc.). Because of intermarriage, economic exchange and other mutual influences, not only Maa-speaking groups but also neighbouring and some other Nilotic (and Cushitic) peoples occur to some extent in this bibliography, covering the disciplines of anthropology and ethnology, (e.g. all aspects of culture), also psychology, medicine, nutrition, health, gender issues and religion (traditional and Christian). Furthermore, the bibliography shows issues of the way of life, the habitat, animal husbandry (incl. pastoralism). The bibliography covers also aspects about the modern development of the society (Social Sciences and education). 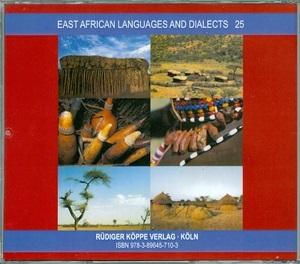 Not only the specialized scientific researcher looking, for instance, for linguistic information and published material in Maa (language and literature), but also the generally interested reader will here find relevant material, because Maasai find entrance even in popular literature, magazines, travelling, tourism, films, music and also research. Arnold Kiel has also included unpublished material like manuscripts, archival information, typescripts and similar items. Non-English titles are translated covering French, German, Italian, Swahili, Maa and some others. Following the links at the bottom, you will find a complete review by Sergio Baldi.